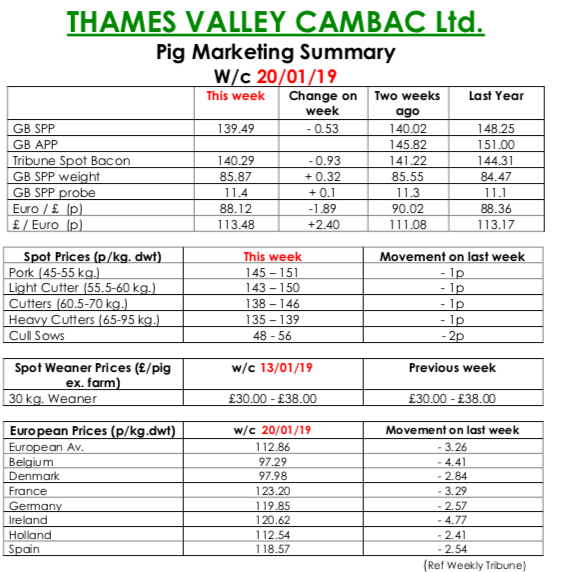 This week’s Pig Marketing Summar, from Thames Valley Cambac, reported that the January doldrums continued to plague trade. Demand was reported as dire by one or two processors, and some cut kills to match. Supply improved slightly with some producers reporting improvements in growth rates. Most pigs were placed, however, with little carryover despite the shorter kills. Prices fell with most contract contributions back a penny, and the SPP continued its downward slide breaking the 140p barrier. There was little life in the fresh meat market, with outlets just taking the bare minimum, and prices eased 1p to 2p. The cull sow market was well supplied again but prices were down 2p due to currency. In Europe, while the influential German market stood on, both Belgium and Ireland lost 2 eurocents. All quotes in sterling saw a reverse however due to a weaker Euro that ended the week down 1.89p at 88.12p. The Weaner Marketing Summary, for week commencing January 13, reported that demand remained weak, despite a tightening supply, as fatteners voiced concerns over higher feed costs and current slaughter market direction. 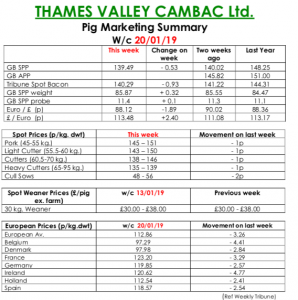 The prices announced by the AHDB saw the weighted average for 30kgs stores rise by 25p to £47.59, and the weighted average for a 7kg weaner rise by 89p to £36.96.